Voting electronically could prevent future problems at election polling stations, some experts claim. The US is planning to introduce e-voting and India has already had it in place for some time. However the British Electorial Commission has expressed concerns about the security of such systems. 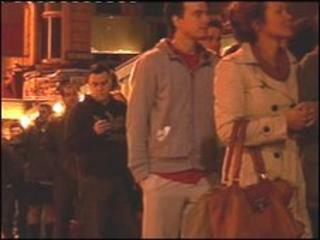 The 2010 UK election was marred for those unable to vote within the designated time frame, due to long queues. David Monks is a local authority chief executive, and chair of Solace, the Society for local authority chief executives' electoral matters panel. "What we've got here is a very Victorian system, that many Solace members have argued is much in need of modernisation," he said. "We need a system for the 21st Century that is suitable for our lifestyles". And technology analyst Ovum has argued that problems at polling stations "will lead to a reinvigorated push for e-voting". It is unclear whether voter problems in the UK's general election actually impacted results in any of the seats where people were turned away. But some observers described the scenes as being reminiscent of the "hanging chad" controversy in the disputed US general election in Florida in 2000, which saw George W Bush controversially elected president. In the wake of that crisis, electronic voting is being introduced across the United States, in part to help prevent a repeat. And in India, the world's largest democracy has been using electronic voting across the entire country since the general election of 2004. Proponents argue that electronic voting is very quick for voters, helps to prevent spoiled ballots, and counts votes in an instant. And if the UK's polling problems were partially caused by slow voting, perhaps all those who were left out in the cold would have been able to vote had they had the option of doing it electronically. A spokesperson told BBC News that the Electoral Commission has been "recommending that parliament should look at reforming the electoral system" for some time. "Electronic voting is an issue that would be explored," she said. Since 2000, the British government has recommended that local authorities pilot a range of alternatives to the paper ballot. In May 2007, five UK local authorities tried out electronic voting, including votes over the internet that could be registered from anywhere. But in a report assessing those pilots, the Electoral Commission found that there were "issues with the security and transparency of the solutions and the capacity of the local authorities to maintain control over their elections". The report added that "A central process must be implemented to ensure that sufficiently secure and transparent e-voting solutions that have been tested and approved can be selected by local authorities." Image caption Will we see machines like these for the next UK elections? There have long been security concerns around electronic voting machines. The BBC has previously reported on warnings from computer experts that early American machines were vulnerable to registering multiple votes from determined users. And there have recently been allegations that India's electronic voting machines are vulnerable to attack. But Andy Williamson, director of digital democracy at the non-partisan think tank, the Hansard Society, argues that "a lack of desire to change" is a better explanation of any resistance to electronic voting than security concerns. He acknowledges the risks with electronic voting, but says "you have to put this in the context of the current process, which we mostly accept, despite the obvious flaws and risks." Those risks, he says, include "the lack of positive voter verification, the obvious risk of moving big piles of paper around, and the fallibility of manual counting." So what does a disenfranchised voter make of the idea of electronic voting? Anna Sheldrake was unable to vote in Hackney, despite being at the polling station half an hour before closing time. "I'd be happy to vote electronically", she said. "Sometimes I feel nervous about using the internet, but I would hope those introducing such a system would take care of the risk of fraud." In the meantime, Ms Sheldrake offered a more traditional solution to the problem: "Simply employ more people". She said the polling station was not ready for the demand. "They should have been prepared for a 100% electorate turning up, and for it to be a democracy, everyone should have the right to vote."